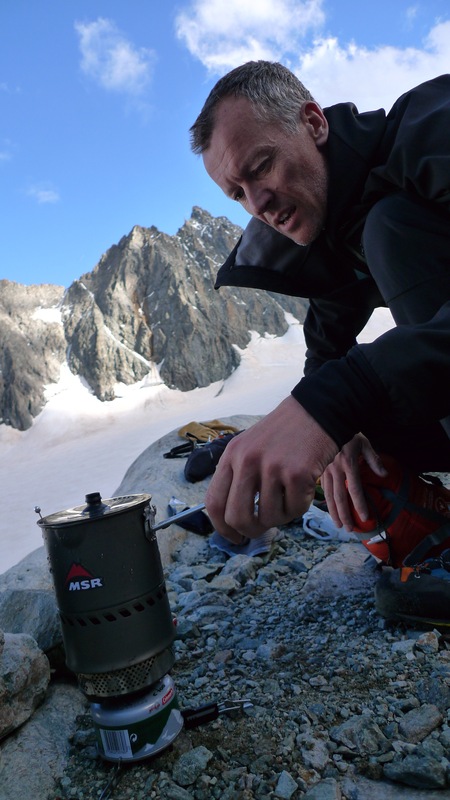 MSR claim that the Reactor Stove System is: “the fastest and most fuel efficient stove ever made” and that it “delivers that level of performance in the cold and wind of the real world.” Kev took that as a gauntlet thrown down and has since tested it in some of the most challenging situations in Europe from the Eiger North Face to the motorway service stations of the UK! What’s his verdict? 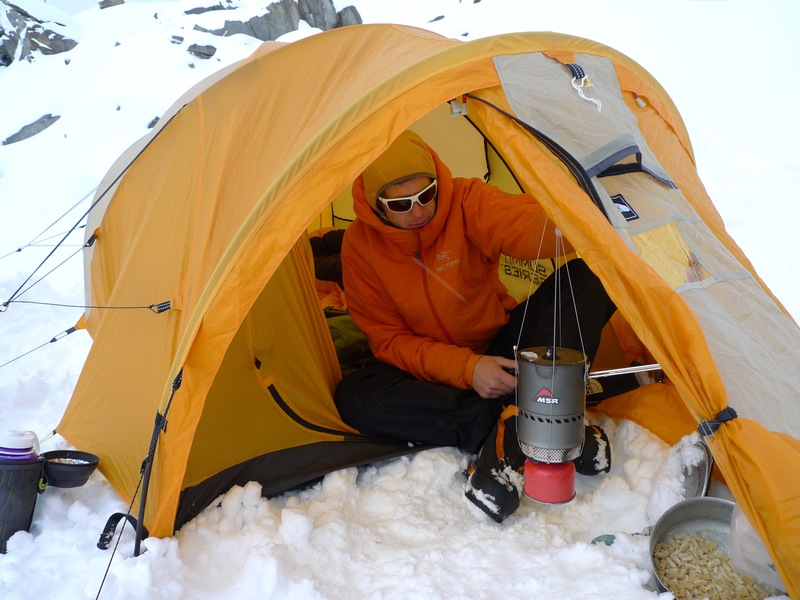 MSR Reactor Stove – using the hanging kit to melt snow in the tent porch. The MSR Reactor is an integrated cook system where the burner and pot/heat exchanger are designed to all work together as one unit for maximum cooking efficiency. The pot/heat exchanger comes in 3 sizes: 1l, 1.7l and 2.5l . I tested the 1l version which is perfect for a pair, allowing you to melt snow to make water or simply boil water to make hot drinks and add to freeze dried meals. 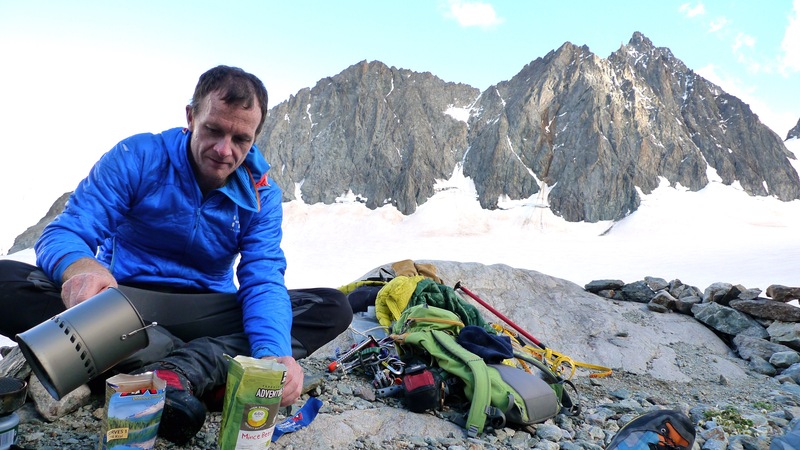 The obvious downside of this system is you are pretty limited with your cooking options but it is essentially a water boiler and let’s face it, the reality is that you are not really going to be cooking a gourmet meal strapped to an alpine north face or big wall. I use this sort of system for convenience and efficiency and if I’m car camping, I take a double burner and proper pans! So the MSR Reactor stove system is best for missions where you need simplicity and are short on space and weight. Alpine climbing, backpacking, big walling etc. I have primarily used it for melting snow to make water to drink and also rehydrate freeze dried meals but it has also had the odd outing in motorway service station carparks when I’ve been too much of a tight arse to buy their overpriced coffee (MSR do a French Press accessory so you can even have the real thing)! In use I was very impressed with the performance of the MSR Reactor Stove System. I need to point out there were no scientific tests going on so anything I say is just based on observation and anecdotal comparison from having used other similar units, but here goes. It boiled water quickly at low altitudes, MSR claim 0.5 litre of water boils in 1.5 minutes and at low altitudes I would say this was fair if there was no wind and the temperature was above freezing. Remember that altitude, temperature and wind will always affect the performance of a stove. MSR do point out that any comparisons they did were in a lab and you can see some test results in the diagram below, although the competition is not specified. The main test for me is how well a stove performs when melting snow, and at this job we felt it was awesome, definitely quicker than rival systems I have used. 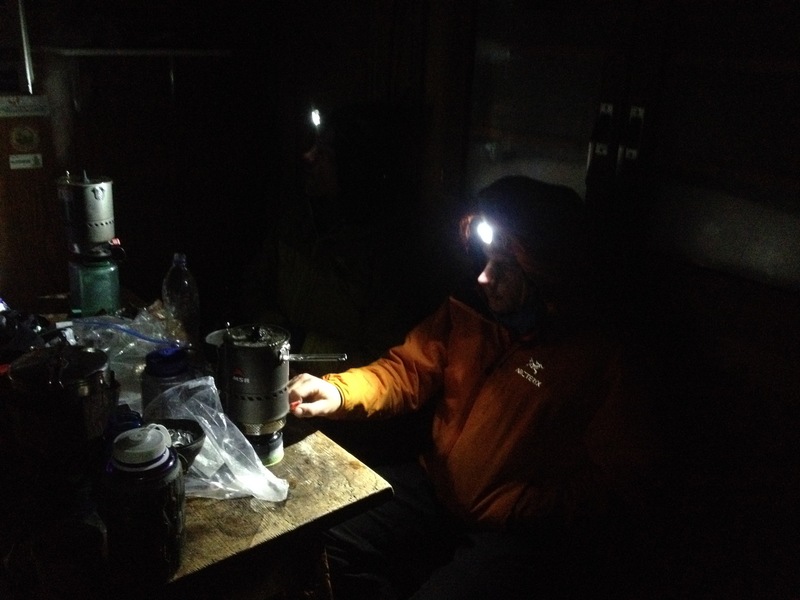 The main limiting factor was nothing to do with the stove itself and more to do with the performance of the gas canister in cold weather and at altitude. It is definitely worth insulating the base of the canister from the cold ground (MSR make little feet for the canister to do this job, but you can also use their excellent hanging kit or perch it on your foam sleep pad) and even going as far as wrapping the canister body in a piece of foam. I tend to sleep with the gas canisters in my sleeping bag too as this speeds up getting your morning coffee no end! The MSR Reactor Stove is high quality, feeling robust but light. It is not the lightest or most compact system out there but it is one of the most reliable I have used, although not 100% reliable. Whilst bivvying on a cold, windy night below the Matterhorn’s North Face we really struggled to light the burner and keep it lit. Once the heat exchanger pot sits on the burner it does shelter it from the wind but in the meantime we just couldn’t get it to light due to the exposed position we were in. I did wonder if the stove was faulty but a pair of friends up there with us had the same stove and it also had exactly the same problem. Luckily we were able to descend and find enough shelter so we didn’t go thirsty but half way up a huge face, this may have been a different story. One other point about the way the pot/heat exchanger sits on the burner is that it doesn’t attach in any way like for example, Jetfoil stoves do. It simply sits on the burner. This has pros and cons but the only major drawback is it is easier to knock the pan over than with the locked on systems, but at least if it’s not all connected you only knock the pan over and not a towering raging furnace, that you then have to risk burning yourself to knock off. A pair of MSR Reactor Stoves in action! Breakfast time in the Solvay refuge, descending the Matterhorn after climbing the North Face. The Reactor Stove System does not have a built in igniter and you need to carry a lighter, matches or flint and steel. This is mainly a good thing as I’ve found that any stoves I’ve had with integrated ignition have usually broken within a few uses. However I do wonder if it would have helped in the above situation (where it wouldn’t ignite in the wind) as you could light it whilst the heat exchanger pan was already on the burner which would offer wind protection. You can only light the burner over the top, not from the side though. The lid and pan handler are integrated and easy to use which is a nice touch, and the pan features a pouring spout allowing easy drainage. As I mentioned earlier, MSR make a hanging system to go with the Reactor and this is a really useful accessory, being light simple and compact. It also securely integrates the pot and the burner making it much more difficult to knock the pan over. 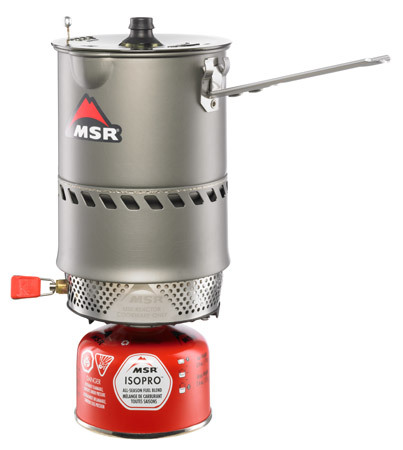 MSR Reactor Stove – great for alpine bivies. I did find the nesting of the burner in the pan for storage to be a little unsatisfactory. MSR claim the burner and a 4oz gas canister nest perfectly in the pot with the lid on but I could never seem to get the burner to sit in and still get a canister in. Either me being incompetent (probable!) or the dimensions needing a rejig? So all in all the MSR Reactor Stove System is a great stove for backpackers and alpinists who want to boil water or melt snow. You’re not going to cook in it as such but it’s designed more with rehydrating freeze dried meals in mind. It is high quality, efficient and robust. We did have problems with performance in the wind though and the burner doesn’t nest satisfactorily with a gas canister in the pan. 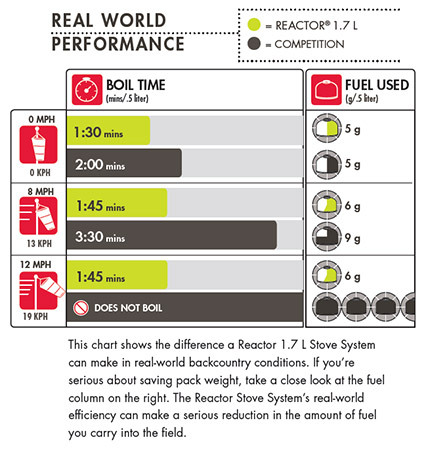 Find out more about the MSR Reactor Stove System at the MSR website. This is a really odd four star review — the Stove outright failed to light in a specific situation, and the kit doesn’t actually fit in the pot with fuel? You mentioned a Jetboil (I consider it the obvious competition), which doesn’t have any issue with nesting and comes with an integrated lighter that might have worked in your Matterhorn scenario. Given the MSR’s negatives, it’s really too bad there wasn’t an rigorous competitive testing involved and I don’t understand why you would give it four stars. Hi, I agree with Colin above, I have a Jetboil for several years, it is working very well, and with the wind shelter (own design), I can boil water – melt snow etc in any wind conditions. Lighter integrated and very fast boiling times. Not to mention the price – way smaller that MSR stoves. I want to mention that I don’t want to promote Jetboil as a brand – is just to point out that there are better options out there, for far less money. Be smart and shop around.